Variable speed, reversing switch for versatility in all applications. 18-volt high performance battery pack for long run-time and battery life. Compact L-shape design allows access in tight spaces while providing optimal balance for user. Factory-set clutch reduces sudden, high-torque reactions if bit jams. Electro-pneumatic hammer mechanism for fast penetration and low vibration. 360-degree side handle for better control and ease of use in tight spaces. Shocks, Active Vibration Control for significant vibration reduction and increased user comfort. STANDARD EQUIPMENT: 1 hour charger, 2-18V XRP batteries, 360-degree side handle, depth rod, heavy-duty kit box. SPECIFICATIONS: 18V, 0-1, 100 rpm, 0-4, 100 bpm, 7/8" concrete maximum, 5/32"-3/8" concrete optimum. 10.5" tool length. 7.6 lbs. tool weight. This compact SDS Drill offers great power with a lightweight compact body. The 18v power pack gives you enough power to use on most jobs. I went with the 18v over the 24v because i was concerned that the 24v would be too bulky and or heavy to use one handed or leaning to a hard to reach space. Coupled with a rapid 15min charger, you will never run out or power. worked like a champ. If you are drilling several holes, I would recommend the Bosch extreme corded hammerdrill. All in all, the tool is a bit pricy but what isn't now days. This product works great, much better than a different company's 18 volt rotary hammer, although it lacks a chipping or hammer only function. However to be fair SDS+ isn't meant for heavy chipping applications, if you need to do alot of chipping get a spline drive or SDS MAX, they work so much faster. I cannot accurately say exactly how many holes I get per charge because I drill various hole sizes (3/16"-3/4"). Sometimes I will use thin-walled core bits, but for the large sizes I usually bring out the corded hammerdrill, this one will drill the hole but it is hard on it. overall a great drill. I have been using a corded sds hammer drill for a number of years and have grown tired of lugging an extension cord around jobsites. When I'm working from a 12-foot ladder the extension cord adds significant weight to the drill. Sure; a corded drill hits harder and drills slightly faster, but the disadvantages, at least in my opinion, outweigh the advantages, thus making a battery hammer-drill a viable choice. And in my case the 18 volt model was the logical choice ... 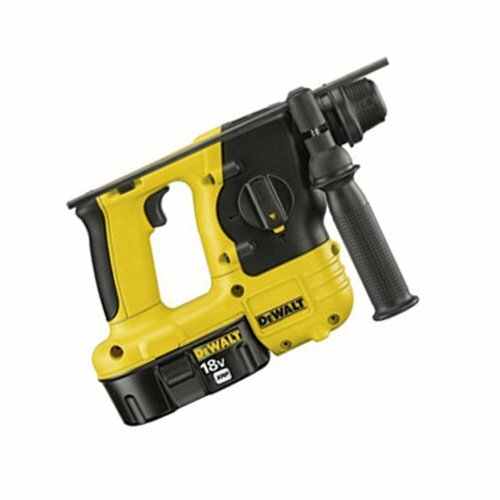 I already use a DeWalt 18-volt drill/driver and have plenty of batteries (as well as a 15-minute charger). I can charge five batteries in the evening, carry them with me to work and not have to worry about running out of power all day long. I seldom drill anything larger than 1/4", so I get a lot of holes out of a single charged battery. This is one of the lightest sds battery drills available, too. If you are lucky enough to do all your drilling in a single location, or if you anticipate doing a lot of chipping or drilling large holes, then go for a corded drill: you'll be glad you did. If your job requires you to move around a lot and/or climb ladders, you will soon appreciate this drill.